LJ Figueroa drives to the hoop. @StJohnsBball. St. John's continued their strong start to the season with a dominant performance against Maryland Eastern Shore, as they cruised to an 85-64 win on Tuesday night at Carnesecca Arena. St. John's improved to 6-0 on the season, and they remain the last unbeaten team in the Big East Conference. LJ Figueroa continued his emergence as a big performer with another big outing for the Red Storm, as he had 25 points on 10-17 from the field, including 4-7 from behind the arc, with 13 rebounds and 2 assists. St. John's wasted no time getting an edge in this one, as they jumped out to a 9-0 lead in the opening few minutes. That eventually built up to a 26-point advantage, 43-17, on a Figueroa three-pointer with around four minutes left. St. John's led 52-28 at halftime, powered by 16 in the first half from Figueroa. 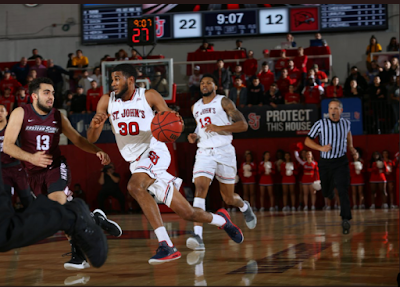 In the second half, St. John's went up by as much as 28, at 64-36, on a Mikey Dixon three-pointer, six minutes in. Maryland Eastern Shore responded with a 14-2 run capped by a Ryan Andino three, and pulled to within 15, at 71-56, on another Andino three with 7:43 left. St. John's put the game away with an 11-0 run capped by a Figueroa layup at the 2:40 mark. In addition to the 25 points from Figueroa, Mustapha Heron had 20 points (6-15 FG, 2-7 three-pointers, 6-6 free throws), 9 rebounds, and 3 assists. Mikey Dixon contributed 14 points (5-8 FG, 4-7 threes) off the bench, with 4 assists and 3 rebounds. Marvin Clark II had 9 points (3-7 FG, 1-5 threes), 3 rebounds, and 3 assists. Shamorie Ponds, who poured in 67 points combined in their two wins in the Legends Classic last week, had just 4 points (2-5 FG), but notched 6 assists and 6 rebounds.